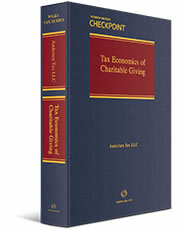 To order the 2017/2018 edition of Tax Economics of Charitable Giving please call 1-800-950-1216. Charitable giving has long been a vital part of wealth management. While the humanitarian and moral aspects of private philanthropy have been its primary motivating forces, the tax benefits that reduce the cost of that philanthropy have increased in importance as our tax system has grown in complexity and scope. Chapter 5: When Is a Contribution Deductible?